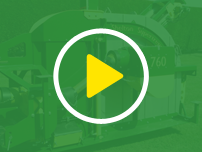 Our CT100 Chain Trencher is ideal for installing land drainage pipes and underground services on sports fields and other turfed areas where minimum surface damage is demanded. 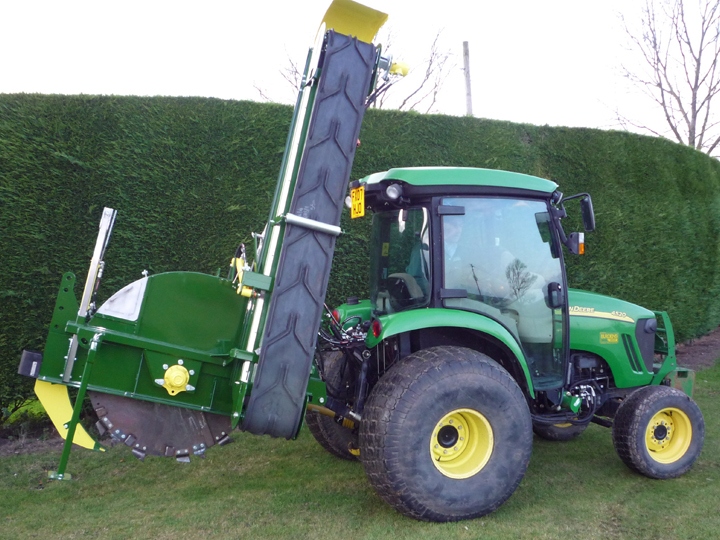 Recently re-designed, the CT100 now has a bigger digging chain to cut a wider trench of up to 200mm wide and 1m depth. 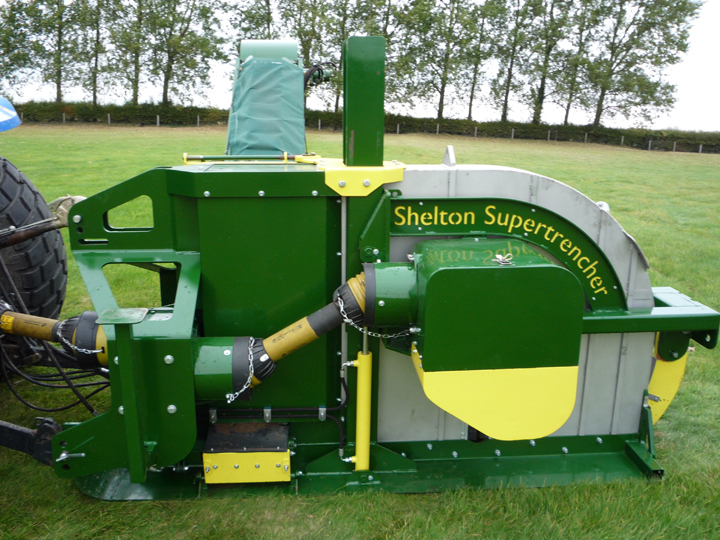 The Shelton Chain Trencher is PTO driven and fits onto the tractor’s 3-point linkage. It is possible to adjust the trench width from 120mm (4.5”) to 200mm (8”). Trench depth is adjustable up to 1metre deep via the in-cab electro-hydraulic controls which allow control of the depth of dig, conveyor on / off and hydraulic crumber lift / lower. The chain trencher’s digging boom and crumber leg can be moved up and down independently of each other via the in-cab controls, enabling a clean entry into the ground. The hydraulically driven conveyor is 3.0 metres long with a robust endless belt. 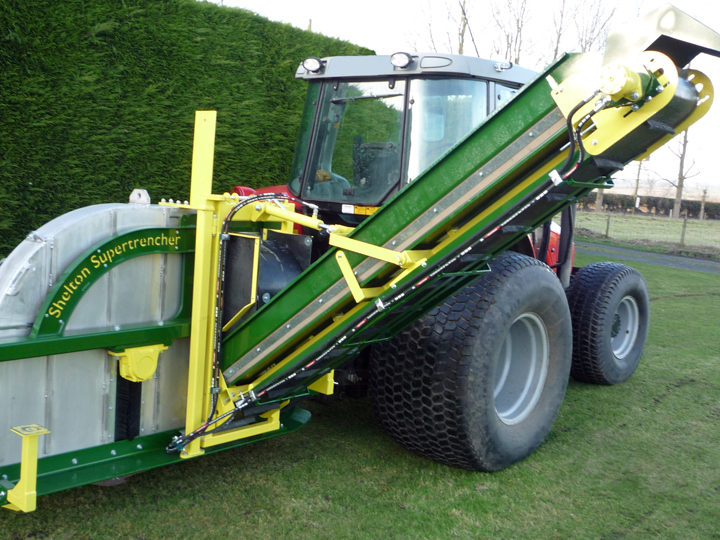 The conveyor is capable of discharging soil up to 2.0 metres high and elevates the excavated soil onto trailers running alongside leaving a clean surface and minimising damage to the turf. A short conveyor is available as an optional extra which allows the soil to be discharged onto the ground adjacent to the trench, when the excavated soil is to be used for backfill material. As the electric valves are fitted as standard the addition of laser grading equipment is simple. For more information or to arrange a demonstration please contact us.